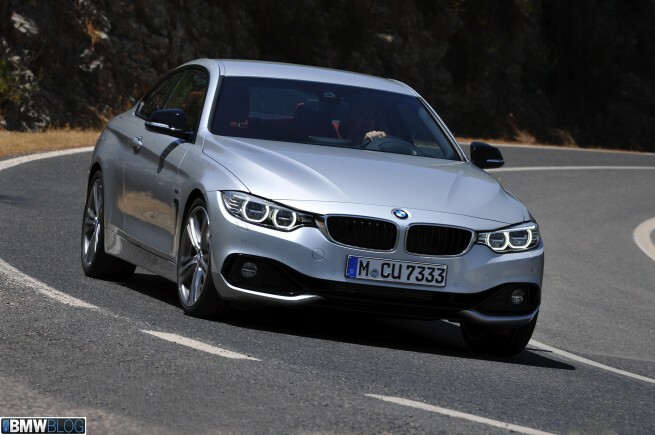 We put the new 2014 BMW 435i Coupe through its paces on curvy Portuguese roads and at the famous Estoril Race Track. With the new 4 Series Coupe, BMW introduces a new numeric nomenclature as a response to the market’s demands and direction. Just like Audi offers an A5 two-door as an extension of the A4 sedan, the new BMW 4 Series Coupe builds atop the F30 3 Series sedan, and along with a sleeker and more dynamics design, it also comes with a premium price. But this is nothing new in the BMW marketing book. The company continues to follow the steps of the 5 and 6 Series models, which use the same platform but are differentiated by the number of doors. Well, sort of (6 Series Gran Coupe). 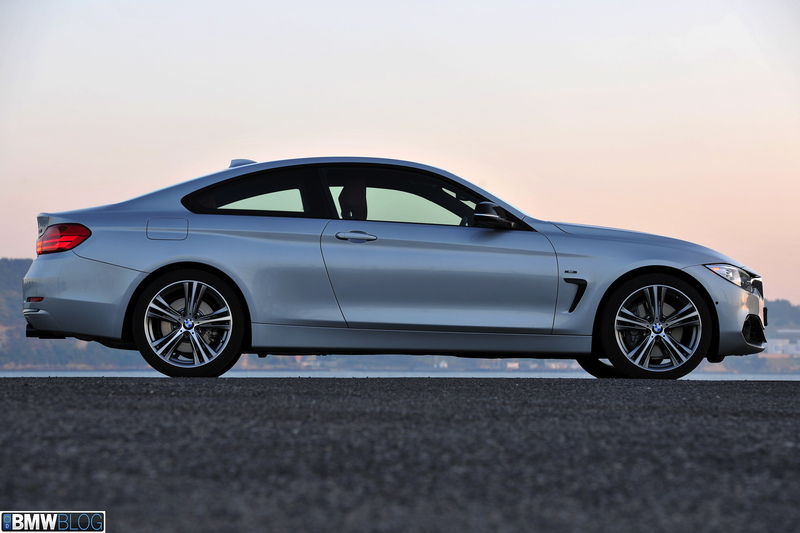 Just A 3 Series Coupe Or The New 4 Series Coupe? While many have called and continue to call the 4 Series simply a rebadged 3 Series Coupe, the truth is that the Munich-based engineers have done much more to clearly differentiate between the two models which use the same platform. The gurus in the engineering department have taken the dynamics of the F30 3 Series and gave the 4 Series Coupe a reworked chassis and new meaning. Though the new 4 Series wheelbase is 50 mm longer than the outgoing E92 3 Series Coupe, the BMW 4 Series has the same 110.6” wheelbase as the existing 3 Series sedan. Its overall length, 182.7 inches, is just a hair longer that the F30 sedan by 0.2”. The new 4 Series overall height is 53.6 inches. This is lower than the existing 3 Series sedan by 2.7” and the outgoing 3 Series coupe by .63”, giving the car a more dynamic and sporty stance. 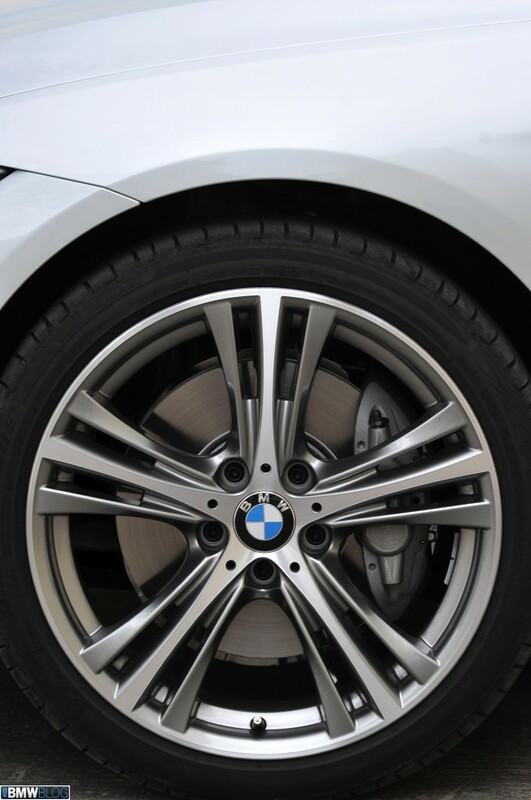 And this statement is validated by the center of gravity BMW says measures 19.6 inches high, the lowest center of gravity of any car in its current lineup. The 4 Series Coupe is also 0.3 inches wider at the front than the sedan (60.8 inches) while in the back is two inches wider. Furthermore, BMW has changed the settings of the springs, dampers and camber angles and strengthened the front section, while also adding two braces between the front subframe and the body. All these differentiators result in a 4 Series model that is 60 per cent stiffer than the old E92 3 Series Coupe, a car often praised for its stiff chassis and superior handling. We’ve known from the moment the 4 Series Concept Coupe was unveiled that the designers reporting to BMW’s Chief Designer Adrian Van Hooydonk have stepped up their game. We have also known that compared to the concept the production 4 Series will go through some changes, but after seeing the car in person and spending an entire day with it, the confident-design stands out among its peer, even in a more toned-down version. In a chat with Van Hooydonk, the design boss says that the coupes are the most emotional cars in the BMW lineup and most important to him and his team. The European model we tested was the top of the lineup 435i Coupe in silver with a black and red interior. To fully appreciate the ride quality, the testers were also equipped with the Sport Line options: larger five-spoke, 19-inch alloy wheels, black trim and blacked-out exhaust tips. In display there was also an M Sport package model that looked even more visually impressive with its M-treatment, and Estoril Blue paint job. 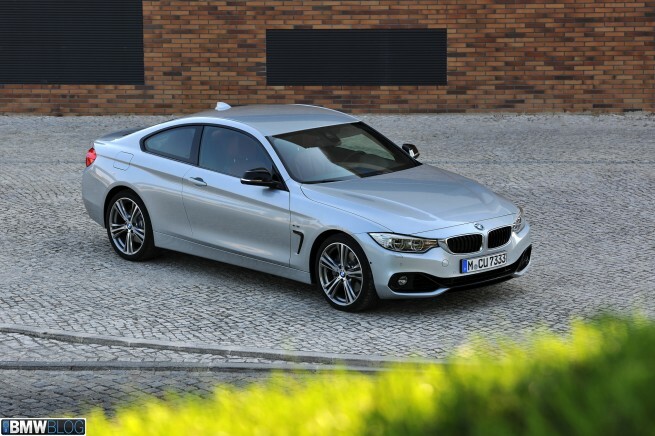 From upclose, the BMW 435i Coupe stands out with its attractive swept-back silhouette, short overhangs and blacked-out kidney grille that give 3D visuals when looked straight on. The new headlight design offer a direct transition to the kidneys, a design trait started by the F30 sedan. The front apron sports two large air intakes voluminous at their outer edges. The Air Curtains introduced with the 1M and then with the new M6 are integrated within the air intakes. The design of the front bumper varies slightly for each pre-defined line. 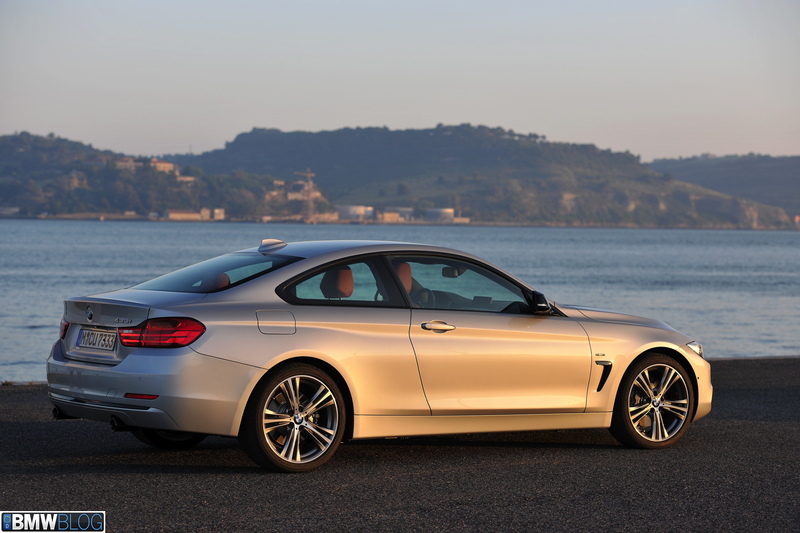 In the back, the tailightss are larger and rounder than those seen on the 3 Series sedan, a design change that keeps the coupe variant as “the good looking sibling”. Convex and concave shapes running across the sides give the 435i Coupe a handsome look, an important selling point in a competitive segment with the Mercedes-Benz C-Class and the Audi A5. The full LED-headlights featured on the tester are also exclusive to the 4 Series at the moment and not available for 3 Series customers. Gone are the days when many BMW owners had to defend their great handling 3 Series in front of Audi owners bragging about the high-tech and premium interior design of their cars. The driver-focused cabin of the 4 Series is roomier inside than the F30 sedan, especially noticeable for those riding in the back seats. At 6″2 (188 cm) tall, I had no issues with bumping my head or knees against the headlining or seats – 13mm more legroom (0.5 inches). 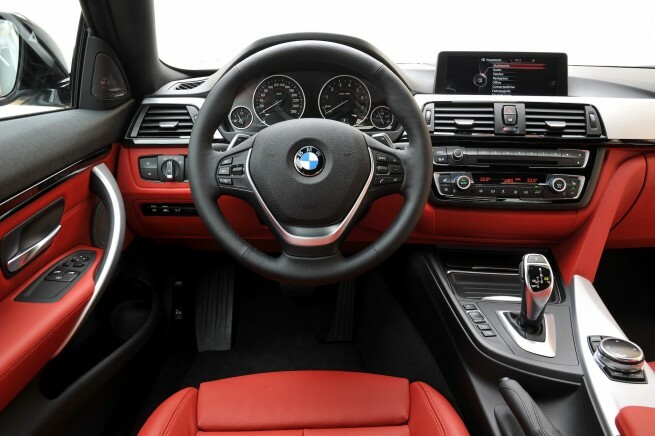 To set it apart from its four-door brother, the BMW designers gave the dashboard a color trim combination not available on the 3 Series: red leather and black/aluminum accents. The character line from the outside flows inside as well, from the dashboard into the rear compartment. The gearbox lever and iDrive Touch Controller are angled towards the driver also. Speaking of the iDrive Touch knob with gestures: we have tried to input numbers and letters with the touchpad and we found it to be even more user friendly than the current iDrive generation. (DEMO: iDrive Touch in BMW 435i Coupe). Most of the car’s functions are now controlled via the floating LCD screen housed above the dashboard. 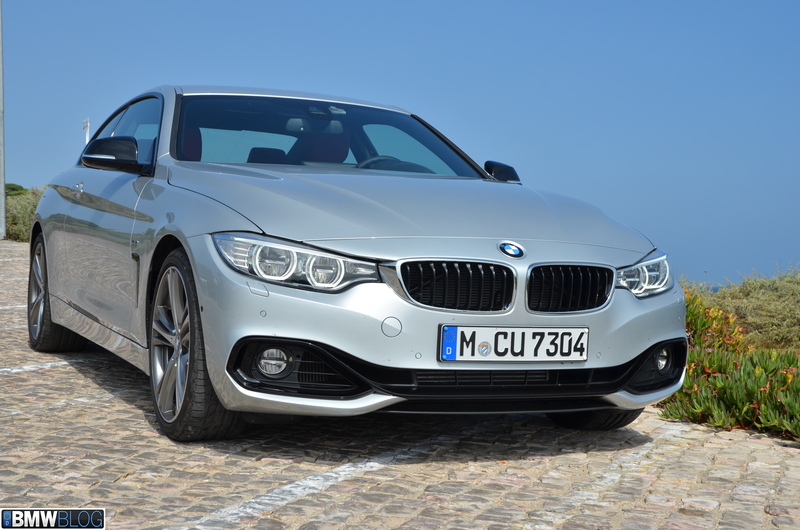 To fully experience the new BMW 435i Coupe we ventured in a long drive from Lisbon to Cascais, through some curvy and scenic roads, including Cabo de Roca, or the most west point in Europe. (Note: a race track review will follow). Over the course of a few hours and a few hundred kilometers, the BMW 435i Coupe impressed us with its sportiness and handling capabilities. 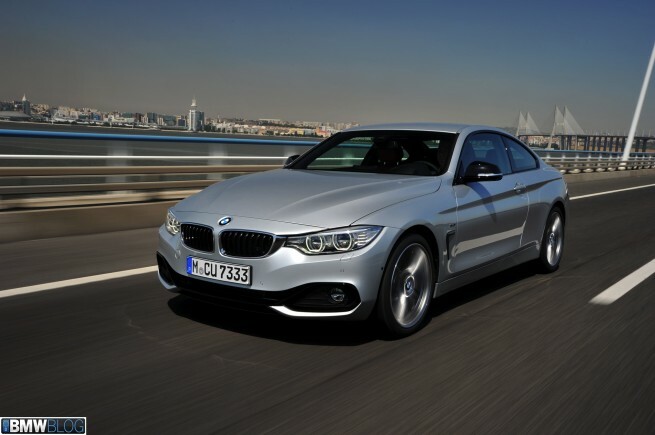 Using the 306 hp, TwinScroll turbo 3.0 liter inline six, the BMW 435i lives up to the Ultimate Driving Machine slogan. The electro-steering is sharp and in-constant touch with the road, while the eight-speed automatic transmission provides precise and snappy shifts via the shifting paddles. The power delivery is smooth and quite impressive especially in the Sport+ mode. 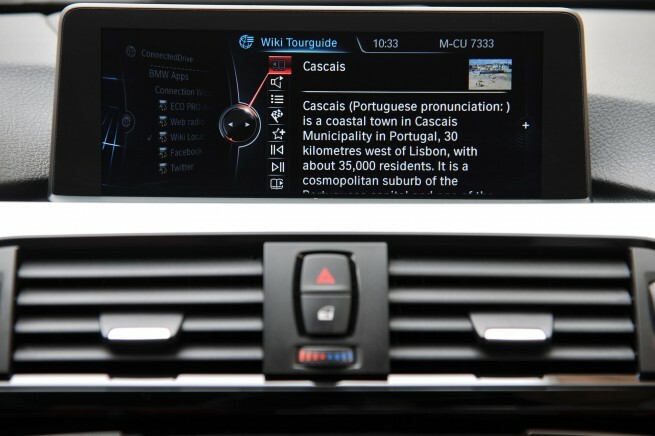 Yes, the 4 Series models just like 3 Series come with four different drive modes: Eco Pro, Comfort, Sport and Sport+. The Eco Pro mode shuts off engine power when your foot is off the throttle, while Sport+ tightness the chassis and suspensions, loosens the stability control and raises the rev limited to 7200rpm mark where now all the power arrives. Comfort mode is the same as in other BMW models, a more relaxed chassis and less aggressive steering wheel, ideal for those situations when highway cruising or stop-and-go traffic come into play. The Bridgestone Potenza SP001 summer run-flat tires – 225/40R19s up front and 255/35R19s in the back – offered plenty of grip while cornering and instant road feedback. Having driven the 335i Sedan several times, I can say with confidence than the 435i Coupe is a more fun and sporty ride, delivering impressive dynamics and overall joy of driving. 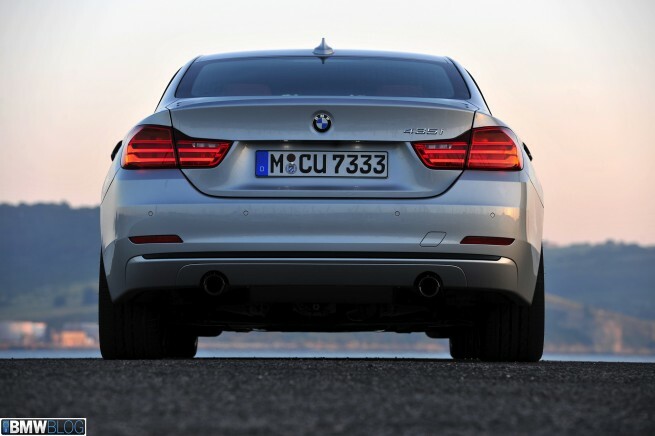 The lower and wider stance, associated with stiffer chassis and suspensions, makes the 4 Series Coupe a “driver’s car” and a tough competitor for the other Germans in the segment. Official stats say that the 435i Coupe will hit 62 mph (100km/h) in just 5.1 seconds, a half-second quicker than the E92 3 Series and only 0.3 seconds slower than the current generation M3 Coupe. After leaving the car back at the hotel, our only thought left in mind was: if this 435i was so much fun, what could the new M4 do for us? I guess in a year from now we will find out what the M engineers have been bragging about in recent conversations. 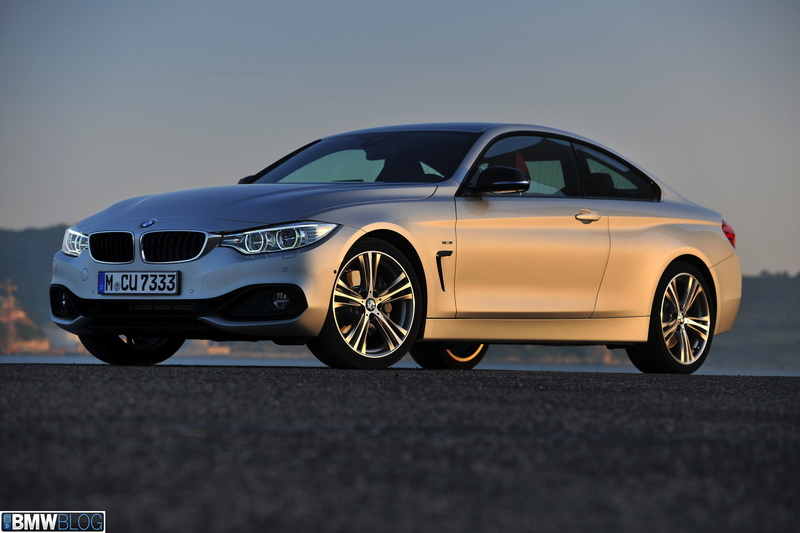 If you’re in the market for a new midsize sports coupe, then the BMW 435i Coupe should be on the shortlist of test drives. With a price tag higher than the E92 3 Series Coupe (46,925 in the US), but with more standard features and gadgetry, the new coupe is a more appealing offering that caters to not only the enthusiasts and die-hard fans, but also to the regular consumer looking for the next best BMW, at a decent price point. In our next review, we will tell you how the BMW 435i Coupe handled itself on the race track, and not any race track, but rather the famous former-F1 track, Estoril.